Who’s a good Rembrandt? You are! Yes you are! 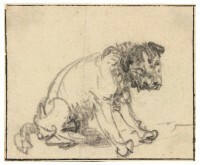 A drawing of a dog in the Herzog Anton Ulrich Museum in Braunschweig, Germany, has been identified as the work of 17th century Dutch master Rembrandt Van Rijn. The chalk sketch of a little terrier, believed to have been drawn around 1637, has been in the museum’s collection since the 1770s, but was mistakenly attributed to German animal painter Johann Melchior Roos. 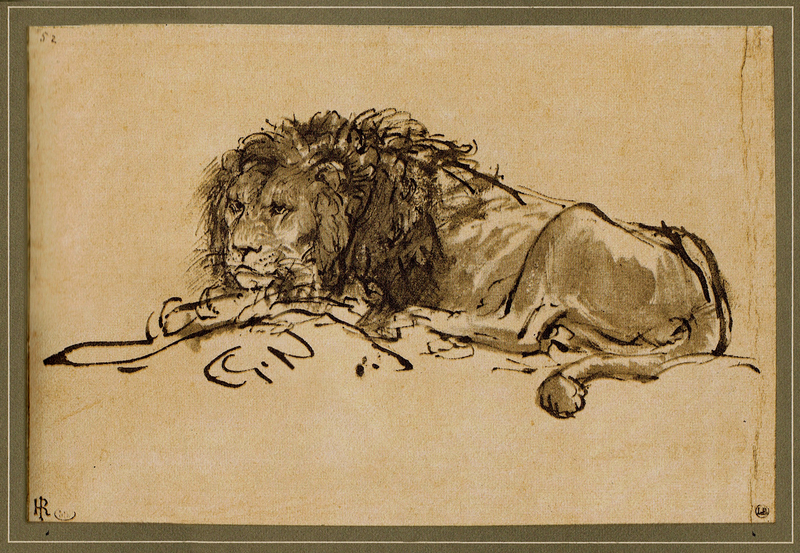 His father, landscape painter and portraitist Johann Heinrich Roos, his brother Philipp Peter Roos, two other brothers and a sister were all known for their drawings of animals. Philipp Peter even kept a mini-zoo at his villa in Tivoli just to have live models for his drawings. The Roos were so strongly associated with animal studies that for centuries if a Dutch/German Baroque animal drawing turned up without a clear attribution, it would by default be categorized as a piece by Roos. The Herzog Anton Ulrich Museum in particular has a large collection of Johann Melchior Roos drawings because he spent the last years of his life in Braunschweig. The dog study was noticed two years ago by the museum’s head of drawings, Dr. Thomas Döring, when he was going through their collection of 10,000 drawings for the Virtual Kupferstichkabinett, a major digitization initiative virtually reuniting the collections of the Herzog Anton Ulrich Museum and the Herzog August Bibliothek in Wolfenbüttel which began life as the private art and book collection of the Dukes of Braunschweig-Wolfenbüttel. The ducal collections were gradually split up between the two institutions between the 18th and early 20th centuries. The Virtual Kupferstichkabinett brings them back together online. While cataloging the drawings, Döring saw the terrier and suspected there was a more illustrious hand behind the dynamic canine that previously realized. “I was used to looking out for the differences between Rembrandt’s work and drawings by other artists,” he explained. Two years of research ensued, including microscopic examinations of the drawing and extensive studies of comparable Rembrandts in museums and collections in Amsterdam, Paris and Vienna. Döring then consulted international authorities on Rembrandt for their opinions. Dr. Holm Bevers, Chief Curator for Dutch and Flemish Prints and Drawings at the Kupferstichkabinett of the Staatliche Museen zu Berlin in Berlin was the first to officially attribute the drawing the Rembrandt. Pieter Roelofs, curator of 17th century Dutch painting at the Rijksmuseum, was the second. An Old Master specialist at the British Museum was the third. Dr. Döring published the drawing as an original Rembrandt in the quarterly journal Master Drawings and so far has received unanimously positive responses. Dogs appear as secondary figures in many of Rembrandt’s paintings, see the little fellow excitedly play-bowing on the bottom right of The Night Watch, and several of his sketches of people have a dog in the scene as well. Other animals he drew — lions, pigs, elephants, camels, cats, horses — as studies for larger Biblical, historical, pastoral and mythological paintings. Not many of his drawing of animals survive. Rembrandt is believed to have collected most of them in a single volume he called “Animals, from life” (“Beesten nae’t leven”) which was listed in a 1656 inventory of his belongings but is now lost. Rembrandt’s doggie will go on display at the Herzog Anton Ulrich Museum starting April 6th in the Dürer, Cézanne, and Me: How Masters Draw exhibition. It runs through July 7th, 2017.